Wendel is pleased to announce the recent acquisition of The Architecture Group (TAG), now a Wendel Company, a firm specializing in Institutional Architecture in Atlanta and the southeast, to enhance its offering to include additional transportation, educational and infrastructure expertise in the area. Two of their main clients are MARTA (the Metropolitan Atlanta Rapid Transit Authority) and the University System of Georgia. Wendel and The Architecture Group share a common purpose and passion for designing transit facilities, higher education and water infrastructure facilities and are in complete alignment in terms of their service to clients, project types and experience, and most importantly, corporate culture. TAG’s current clients in the Atlanta area will also benefit from their newly extended professional resources and advanced technology; especially the addition of engineering and construction professionals in house that will give projects the opportunity to be managed by a simpler team. “It is an exceptional opportunity for The Architecture Group to join Wendel, a company of like vision, philosophy and culture. It offers TAG the ability to frame our future in the larger context of the AEC industry throughout the southeast. The continued growth we are experiencing in Atlanta and the region requires greater expertise and expanded resources. It also requires the simple desire to serve clients in the best way possible, a TAG philosophy since its inception. As in the past, and today as part of Wendel, we plan to do just that.” – Bobbie Unger, TAG. 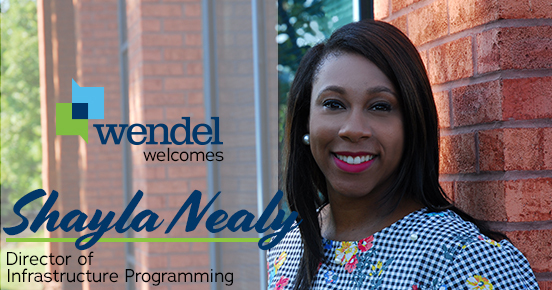 Wendel is pleased to announce the expansion of our presence in the Southeast and the addition of Shayla J. Nealy as Director of Infrastructure Programming. Shayla brings leadership and many distinct competencies to Wendel. She has spent a good portion of her career focusing on improving the Atlanta Region’s water infrastructure as well as devoting her time to the betterment of the community. She will be working in Wendel’s new Atlanta, GA office and will focus on both business development and leading projects and initiatives for infrastructure clients in the southeast. Shayla is in her second term as a Councilmember in Union City, GA and previously worked with the Clayton County Water Authority as a Water Resources Engineer. She earned her Master’s Degree in Public Administration from Central Michigan University and Bachelor’s in Biological Systems Engineering from Florida A&M University. She is also a graduate of the Georgia Water Professionals Leadership Academy, and serves as a Flint River Basin Advisory Council Member and on the board for the South Fulton Regional Municipal Water Authority. As a testament to her professional dedication and service relations, Shayla is also an honoree of Outstanding Atlanta – The City’s Premier Honor for Community Involvement Class of 2018, “Most Influential” in Who’s Who in Black Atlanta in the last three annual editions, and the 2016 Jack C. Dozier Emerging Leader of the statewide Georgia Association of Water Professionals. She was also honored as a 2014 Atlanta Business Chronicle’s 40 Under 40 recipient, and as one of Georgia’s Best and Brightest in the 2011 Georgia Trend 40 Under 40.